With impressive portraits, fascinating still life pictures and lavish furnishings, the Golden Age was an era when Dutch design flourished. This heyday, which lasted around 100 years, is still very much apparent, particularly in Delft, today. Not only because of the world-famous Delft blue ceramics, but also because of the traces of the famous Dutch painter Jan Vermeer, who lived and worked there. The monastery of St. Agatha was built in the town, which is less than half an hour from The Hague, at the beginning of the 15th century and was converted into a princely residence about 150 years later. The museum’s current name, Prinsenhof, suggests its glorious past and the holy character of the building complex has also been preserved. 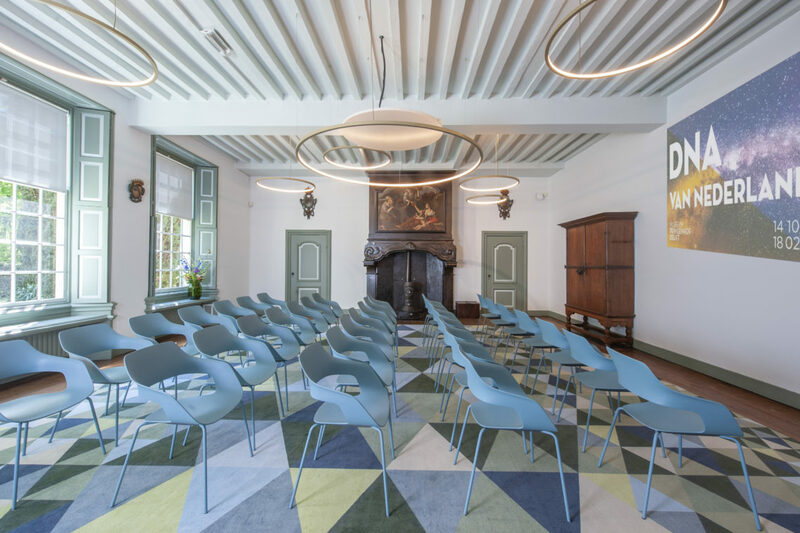 In addition to a collection of arts and crafts from the 16th and 17th centuries, the Prinsenhof Museum offers rooms to hire for private events, meetings or conferences. The Kamer van Charitate is one of these. 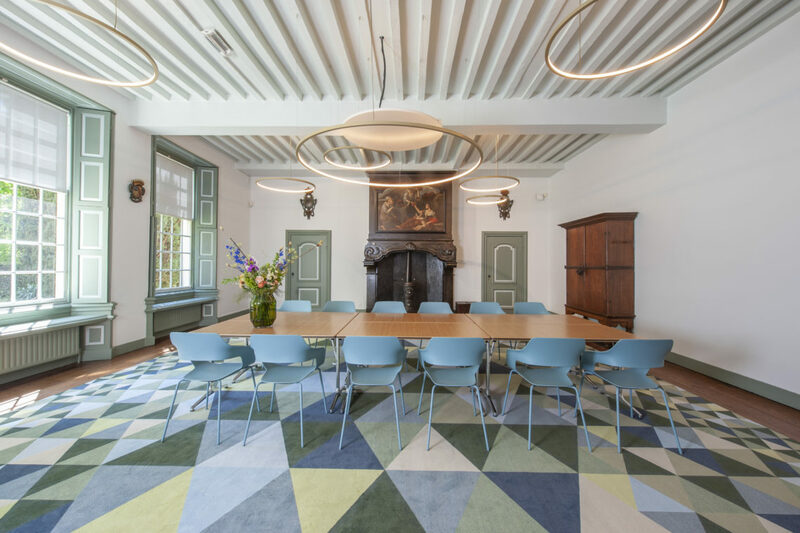 Dutch design studio same-d was commissioned to redesign the room so that it retained its historical character. The designers harmonise modern design with the existing backdrop: a magnificent fireplace and above it a painting from the Baroque era contrast with geometric design forms and the contemporary furnishing style. A large rug is positioned in the centre of the room. Apart from the fact that it absorbs sound, it also defines the colour scheme in shades of blue and green. The designers chose a multipurpose chair from the Wilkhahn Occo range (design: jehs+laub) as the seating for the conference or presentation backdrop and the blue-grey version of the chair goes well with the colour scheme. The characteristic seat shell in combination with the four-leg slim tubular steel frame offers superior comfort and it’s possible to stack up to ten chrome-plated frame versions of the chairs too. The room’s varied design is complemented by Wilkhahn’s mAx folding tables (design: Andreas Störiko), which are easy to handle, making them ideal for areas that often need to be rearranged. More about the design studio. Click here for everything about the Occo chair.